On our way to Jane-Anne's 50th birthday party earlier this year, Jacques once again asked me whose party we were attending. 'My friend, Jane-Anne's', I replied. Again. 'Have I met her?' he asked, puzzled. 'Why not?' was his response. 'Because I've only met her once.' I told him, by now exasperated by the conversation. 'Because she's my Twitter friend. And I know her well, we tweet all the time. And she makes me laugh. And she also reads The Daily Mail. And she rages against injustice. And she has a really great blog about food. She knows her stuff. I like her. And I want to go to her party.' I argued defensively. 'Fine' he said, still puzzled. As someone unfamiliar with Twitter would be. Anyway, we both had a fabulous time at Jane-Anne's party, the food was fabulous (as you'd expect), the company great (like-minded people), the speeches made me laugh and at one point get a bit teary, and her son and his band performed. All in all a great night out with friends. So this is my long-winded way owning up to the fact that I consider Jane-Anne Hobbs a friend and so whatever follows may be conceived as being biaised. 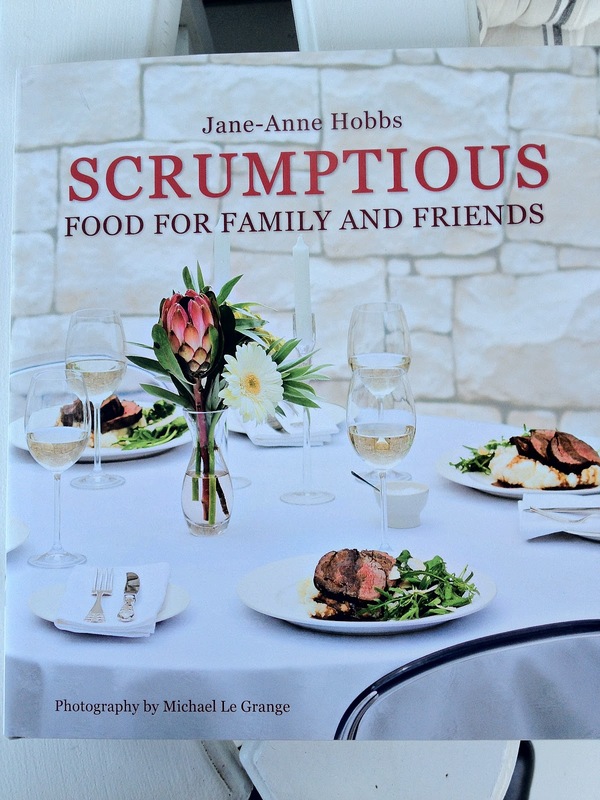 But honestly, my mom does not know Jane-Anne and she loves this book, loved its format, it's design, loved the photographs (by the talented Michael Le Grange), loved the recipes. In fact she lauded it 'the best cookery book I've seen in a long time.' And my mom's no bullshitter. Jacques also expressed an opinion when he saw the book. 'It's a bit higher grade for you, isn't it, love?' he commented, referring to the long, detailed recipes. And so I set out to prove him wrong, because I have more faith in Jane-Anne's ability to write a recipe than my husband has in my ability to follow one. I made the Moroccan-Spiced Chicken Pie, because we had our honeymoon in Morocco and we both love the flavours of this magnificent country. 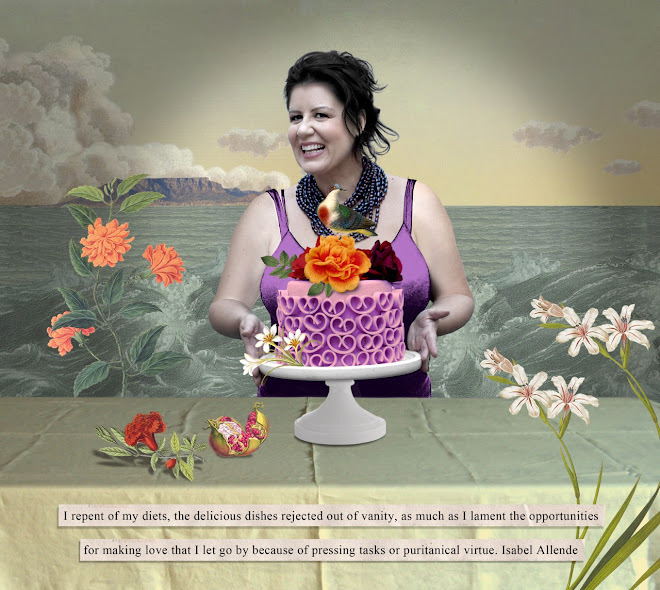 My intention was to seduce him with memories of Marrakech and impress him with my pie-making skills. I managed to do both. Extremely well, I might add. Now, Jane-Anne can take no credit for the former, but I will certainly thank her for her help with the latter. The pie turned out beautifully. Absolute perfection. And incredibly delicious. Scrumptious, in fact. 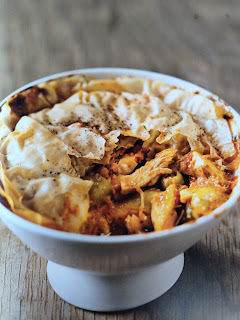 This preserved lemon, green olives, paprika, cinnamon, ginger, cumin coriander, cinnamo-sugar-dusted-phyllo-pastry bedecked chicken pie gave me the confidence to move away from those familiar few-ingredient-few-step recipes I'm usually so fond of. This recipe book is brilliantly written. Follow the clear, concise, detailed, step by step instructions and you cannot go wrong. It is almost as good as having a friend who knows everything about cooking being in the kitchen with you and telling you how to do it as you go along. I also love her notes on shortcuts or preparing things in advance like 'This filling can be prepared the day before, and you can assemble the pie up to 3 hours before you bake it. Keep tightly covered with clingfilm to prevent the pastry from drying out, and bring it up to room temperature before you bake it.' Perfect advice for someone like me who gets flustered if I have to do too much shortly before the guests arrive. The recipes in the book are also meant for between 8-12 people which is fantastic if, like me, you don't like maths and multiplication and believe that food tastes better when eaten in the company of many. There is also a lot of variety in the book; interesting starters (Mashed Feta with Artichokes, Lemon and Olive Oil), exciting salads (think Cauliflower Salad with Crisp-Fried Chorizo), robust meaty meals (Lemony Lamb Shoulder with Potatoes en Papillote), great vegetarian options ( Lentil and Butternut Bobotie) decent deserts (Nougat and Ice Cream Cake with Hot Raspberry Sauce) and some old-school favourites with modern twists (Salmon, Egg and Dill Pie with lemon butter). But all of the recipes indicate that you've gone to some trouble to prepare something special for those you love and like. She's a clever one, our Mavis. And she generously shares her knowledge. You'll be wise to learn from her. It looks a wonderful book and I have yet to get my hands on a copy, but I will. I've been cooking her recipes from her blog for ages now and they all become old favourites. This from someone who counts Jane-Anne a friend even though I've also only met her once - more through blogging and Facebook than Twitter. I only joined Twitter last week and it was Jane-Anne who gave me a rousing introduction to all her many Twitter friends. Thanks Jane-Anne... and thanks Sam for a great review of her book! Kit! Thank you for taking the time to write. And yes, it is a wonderful book as you you can imagine anything that J-A would do, would be. And I love your blog, so please tweet me @samwoulidge so that I can follow you on twitter, that way I an keep up to date with all your posts. Take care, and hope Spring is behaving beautifully where you are.